But, first, a little background. One of my dreams from a young age was to 'rescue' people, things. I dreamt I was 'Superboy' and I would fly around and find abused kids and defend them or rescue them. Now days, I feel that same thing from time-to-time, when I see old war-horses still suffering the loss of comrades, women who had their faces destroyed by acid or fire, people with disabilities. I also realize that actually having that kind of superpower is fraught with problems. You can't 'touch' everyone. You'd end up doing nothing else in a world filled with billions who are suffering. And, worst of all you can't know what is in people's hearts. You might heal someone and have them go on, unleashed and take vengeance, or become a dictator. After all, it is often our pain and suffering which makes us 'who we are'. It would be like having the 'Ring of Power', like Galadriel in Lord of the Rings, and she turned it down. 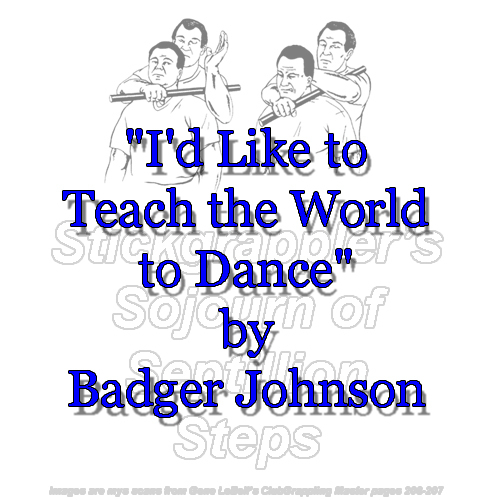 So, instead, I thought, maybe it's better to teach the world something else, as the title says, to Dance. Dance by themselves, dance with a partner, dance with a group. That, my friends, is exactly what the wonderful "instructors" of the Martial Way here, in our little group are doing. One student, one class at a time they are traveling the world and teaching people to dance. I would issue two challenges. One, don't just teach the dance of death (I know you aren't by seeing your smiling faces and smiling students). Two, actually take your students out to a dance. Get them to do swing dancing, or jitterbug or something. Actually have 'dancing' as part of your promotional exams. I've often said that a MA who can't dance won't be a very good fighter. Sorry about the diatribe, and thanks for reading. Now, go out in the world, or just your backyard and shake your booty, and do it like nobody is watching. NOTE: My sincerest appreciation for Badger's gracious consent for permission to archive his essay to my site. Please leave Comment/Feedback for Badger below.